Braxton Lee went 1-for-2 in a loss to the Braves on Sunday. 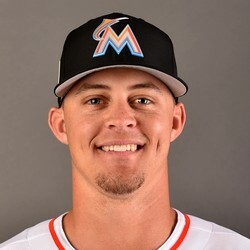 The speedster is vying for a spot on the Marlins' opening day roster. However, the signing of Cameron Maybin may leave him the odd man out. In Double-A last season, Lee batted .309 with a .390 OBP and 20 stolen bases. He may be ticketed to start the year in Triple-A, but he could be an asset in NL-only leagues due to his speed and ability to get on base. He will need to earn the opportunity for some at-bats first. This spring, Lee is batting .267 with two stolen bases.